Even as the Centre and the state government geared up to foil the Bharatiya Janata Party’s ‘Ekta Yatra’ to Lal Chowk in Srinagar, the main opposition party declared it would defy prohibitory orders and the crackdown and go ahead with its plans. “We will unfurl the Tricolour (at Lal Chowk). That is definite. We know how to reach Jammu. We know how to reach Srinagar,” asserted party spokesman Prakash Javdekar in New Delhi. 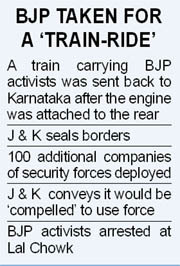 But a special train carrying 1,500 BJP supporters from Bangalore was intercepted by the police in Maharashtra and sent back to Karnataka. When the train, with 18 bogies, arrived at a station close to midnight on Saturday, the authorities blacked out the station and, taking advantage of the darkness, delinked the engine and attached it to the rear. Two additional bogies with security personnel were attached to the train before it was flagged off on its return journey. By the time the BJP workers realised that they had been taken for a ride, it was too late. But senior BJP leaders were livid. “Under what law were they not allowed to proceed to Jammu? After all they had valid tickets,” said Venkaiah Naidu while others called the ‘draconian and undemocratic’ step a reminder to the black days of the Emergency. In Srinagar, security was tightened and the state government prepared to deploy 100 additional companies of securitymen to thwart the BJP plan. State vice-president of the BJP Sofi Mohammad Yousuf was taken into preventive custody and patrolling intensified. State borders have been sealed and the state government mulled over the feasibility of closing the Jawahar tunnel through which the Yatra would have to pass from Jammu. After a review meeting at Srinagar, which was presided over by the Chief Minister, it was conveyed to the BJP that the state government would be ‘compelled to use force’ if the party insisted on unfurling the national flag at the Lal Chowk. The BJP, however, showed no sign of relenting and publicly turned down the appeal of the Prime Minister against pursuing a “divisive agenda” on Republic Day. BJP parliamentary party chairman and veteran leader LK Advani wrote in his blog “State is surrendering to the separatists who have declared that they will not let the Tricolour be hoisted.” Senior BJP leader Arun Jaitley also described the Prime Minister’s appeal as a “psychological surrender” to separatists. Advani recalled how separatists had hoisted the Pakistani flag on Eid at Lal Chowk last year in full media glare and wondered why the Indian flag cannot be hoisted at the historic place on Republic Day. The Rashtriya Ekta Yatra, led by Bharatiya Janata Yuva Morcha (BJYM) chief Anurag Thakur, was flagged off on January 12 from Kolkata. After passing through 11 states it will complete the Punjab leg of the journey on Monday. The journey will then seek entry into Jammu and Kashmir from Lakhanpur border, according to the BJYM plan. It is the same border point that was taken by founder president of erstwhile Bharatiya Jana Sangh, Syama Prasad Mookerjee 58 years ago. Describing the measures taken to foil the Yatra as “disproportionate”, Jaitley declared that the Prime Minister’s stand was “unacceptable”. He wondered how hoisting of the national flag could be “divisive and provocative”.